Can I enjoy the sight of hundreds of dead mosquitos on the front of a million dollar car? 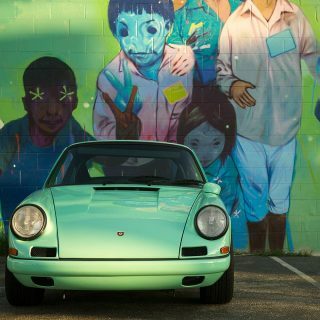 Unless these machines are used during events like the Mille Miglia, many owners won’t take their prized possessions for a proper, bugs-on-the-front road trip: they’ve become, for many, too valuable to be driven.. 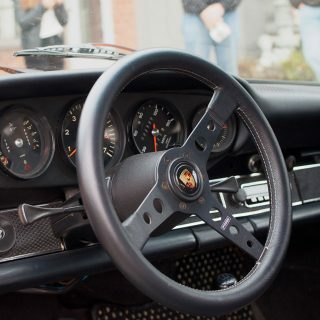 The Porsche 911 2.7 RS has always been one of my dream cars, and I was surprised to meet someone who dares to use this car on the road regularly. A few weeks ago, I was extremely happy to ride beside him for 350 miles in some of Italy’s most beautiful roads. 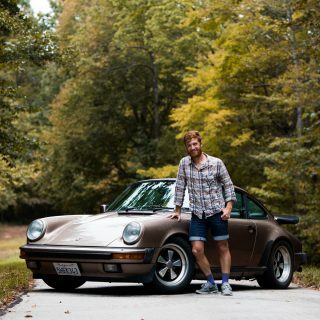 This article wasn’t expected: it all happened when my friend Enrico called one evening and asked if I wanted to join him for a ride in his 911, all the while following the Modena 100 Ore Classic rally! I still cannot decide which one of these two things was more exciting: the Porsche or the race. The trip was simple: starting from Bologna, we stopped to the Autodromo dell’Umbria in Magione, then through Arezzo, Florence, and back to Bologna. I live in Como, which is a small town close to the Swiss border: to reach the start of our trip I left home at 3am, and drove down south. After a two hour drive, I reached the garage where the car and his driver were waiting for me. 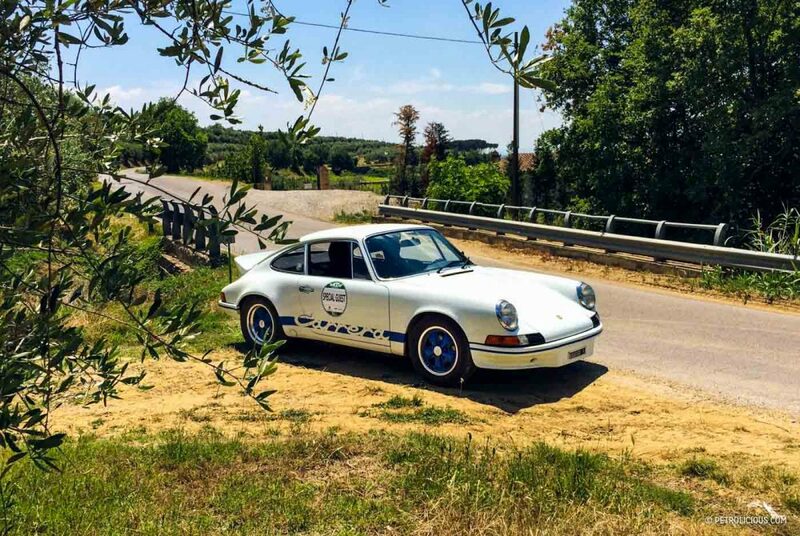 In the morning light the silhouette of a white 1973 2.7 RS with blue livery and the iconic “ducktail” looks terrific. Our car had a high content of “want”: full racing bucket seats, MOMO steering wheel, and blue Fuchs wheels. The car wasn’t in pristine condition, and yet it was still incredibly desirable. There were some flaws, notably a few stone chips and imperfect paint, but should one care? As I put my bag behind the seats, Enrico looked at me with a smile and said, “I want to keep it like this because I can use it with no problems and no—I won’t sell it”. After packing some bottles of water for the day, we fired up the engine and made our way down to Magione. The car was healthy, and had a generous power delivery. I won’t say how fast we were sprinting through the countryside, but let me tell you that it can more than keep up with fast modern cars. As we were rolling down on the Autostrada, Enrico told me a few details about the car’s history: it was originally painted in rare Dalmatian Blue and was sold new in Switzerland. After just one year, the car was sold and came to Italy…where it was turned into a rally car. During this time, the engine was upgraded to three liters and the suspension was reinforced. 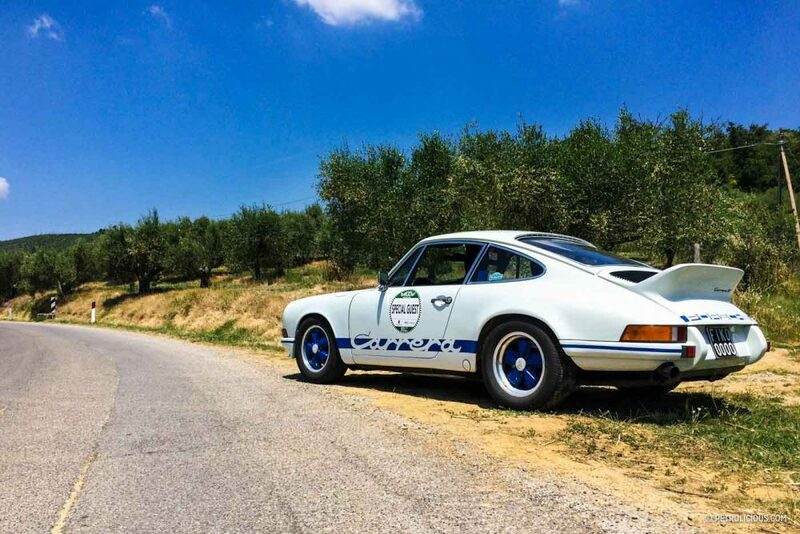 It remained in this configuration for 10 years, and it was a regular entrant in rally competition across Italy. After the second owner retired from racing, it was sold and, later, brought back to road specification. It changed hands two more times, and in the early nineties it was repainted with a more classic white with the iconic blue Carrera livery. The car reached the hands of Enrico a year ago, and still wore clues from its racing past: stiff ride, torquey engine, and a beautiful spartan interior with no sound deadening. Wonderful. After two hours on the Autostrada, we reached the Modena 100 Ore just in time to witness the start of the first group of cars on the local circuit. This event may be called a less known and less celebrated version of a rally like the Mille Miglia. Starting from Rome, the cars tour up to Modena, completing hillclimbs, regularity stages and special trials at four racing circuits: Vallelunga, Magione, Imola and Mugello. The 100 Ore is four days of hard driving with two types of competition: classic racing and regularity rally (TSD) stages. 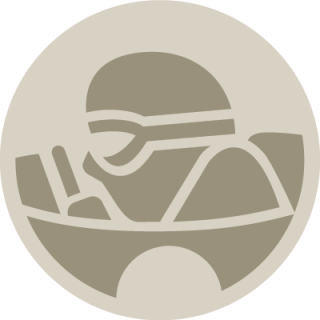 If you can a race next year, consider this event: it’s a bit of Goodwood and a bit of Mille Miglia all in one. After all cars had completed their sessions on the track, they left on public roads for Arezzo: some of them were driven with slicks on public roads! With all the cars gone, Enrico and I hopped into the RS and drove to the next stage of the race. The roads there were just fantastic and offered a wonderful view of Lake Trasimeno. The car felt right at home, and delighted us with its amazing performance. 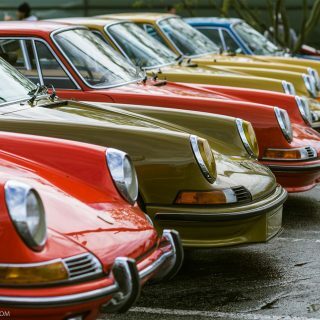 The RS is one of the ultimate 911 driving experiences. It is extremely light, darty on the road, and very rev happy. Light movements of the steering wheel and precise throttle inputs are the keys for keeping the car balanced. On a twisty road, it’s pure joy to: easy oversteer and easy analogue controls will make anyone smile from ear to ear. The sense of satisfaction when experiencing such a car is meaningful. It makes me consider what carmakers call “progress”—if something is so perfect from the beginning, why change it? Everything works on the RS, and there are few complaint. The roar of its glorious engine echoing against olive trees and ancient city walls alike is an utter privilege—and a bit emotional. After a few hours spent carving the roads between Umbria and Tuscany, we arrived in Arezzo for a quick stop in the city centre: 50 beautiful classics in the town square. Good food and wine are always a treat. We hopped into the car again and followed the convoy to the next stage, located south of Florence. Always on B roads, we followed two Stratos (one with the Alitalia livery and one Stradale), a few other 2.7 RS’, a 911 RSR Turbo, and a Jaguar XK 120. We had to move fast, because we had, sadly, only one day to follow the event and skipped the last stage and proceeded to Florence to witness the arrival of the cars in Piazza Ognissanti. Unfortunately, we couldn’t find our way inside the town due to its strict traffic limitations. From Florence, we set off to Bologna, on our way back. It’s only at this point Enrico told me a fun fact about the speedometer in his car: it actually indicated a speed that was 20% slower than your actual one—which means an indicated 80 mph was more like 90! We arrived tired, sweaty, but happy—the perfect end to a dream-like day. well said, that’s my aim when I write. I prefer giving the reader the illusion of being in my seat rather than just describing the car model. Gotta be honest here. I’ve read your comments GS. I’m severely underwhelmed. Not to put too fine a point on it, but you put me in mind of a work colleague who was referred to as the cashmere hairball. You obviously enjoy reading your comments, but they are tiresome and really are all about you aren’t they? Obviously that’s just one man’s opinion. Except I’ll bet I’m not the only one. I don’t think there are many who have driven an RS who would agree with your assessment. One man’s opinion is exactly right. what exactly was it that left you underwhelmed? the peaky motor? 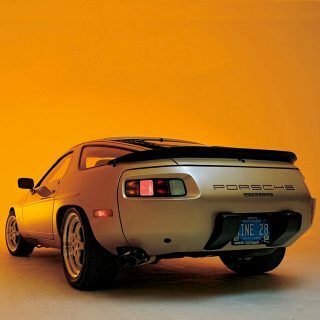 for a car of its era, the performance is exceptional. 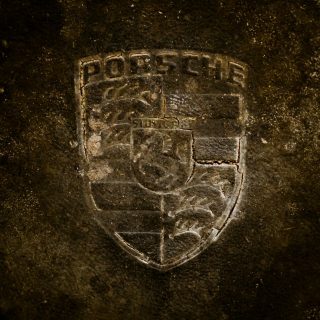 I get that you can replicate or exceed the handling/performance for [i]a lot[/i] less $$ by modding a more common 911. Wow.. Awesome this is Wonderful car.. Great design Thanks.